This is the only forum I'm on and I don't spend much time online. I've looked around a bit lately and something is bugging me. There has been a lot of controversy about where Obama was born. It seems a bit over the top. His Ss number not right. Folks in Kenya saying he was born there. All that nonsense. Now I'm wondering not where he was born but WAS he born. Is he even real? Could Obama be 'Simone'? AmongTheThugs wrote: This is the only forum I'm on and I don't spend much time online. I've looked around a bit lately and something is bugging me. There has been a lot of controversy about where Obama was born. It seems a bit over the top. His Ss number not right. Folks in Kenya saying he was born there. All that nonsense. If I were Sherlock Holmes... I'd say this issue merits further investigation. What to make of this, Watson? I have been thinking about this whole Obama's birth affair for a long time now . Why do we even hear about this stuff ? Why can't they just produce a birth certificate to end this whole thing ? Why is Alex Jones all over it ? What is it ? Maybe the dude is just an actor ? Maybe some President puppets in the past caused some problems and now they just want to be sure and hire actors? Keep on digging my friends ! - Are the NASA HOAXERS extremely stupid? - Are the NASA HOAXERS testing the limits of human stupidity? Currently, I must humbly admit that my mind is split 50%/50% between these two (equally disturbing) options. There are lots of videos on the subject. Really though, only a cursory viewing reveals an appalling excuse for a forgery that must be intentionally poorly made. It only gets worse when you zoom in. Are the same people who have managed to take control of the country really this inept? Are we some sort of lab rats in a psychological experiment? I sincerely hope that they are simply a capricious bunch and enjoy a good laugh at those who do buy into the official story. What do you guys think? Intentionally laughable, or simple laziness? I was amused to see that the latest installment of the Birth Certificate Soap Opera has B.O. 's own attorney admitting in court to the judge that the infamous document is fake. And, raising the absurdity level to new heights, this attorney argued that, since it is an obvious forgery, it should to thrown out as evidence that B.O. is ineligible! Huh? – think about that one for a moment. But anyway, not to be outdone in this theater-of-the absurd, the judge agreed. Since this is now all over the web and YouTube I won't bother posting a link as I would rather not advertize the blogs and sites that are involved in this farce. Personally, I don't care where this BOzo was born, nor am I sure if he even really exists, but I can't help being curious as to the purpose of all this ridiculousness. Will this political joke ever have a punchline? If so what will it be? Is this all really just a new Mel Brooks movie? Or, are the perps simply going senile in their old age? BC is fake, therefore Oby is American-born. Tower-gash is real, therefore all fakery (will soon be) discredited. "What I'm actually seeing looks like a Hollywood movie!" All lies are truth, because all truths look like lies. I thought that maybe this could be our general thread about Barack Obama, covering whatever deception/distraction/cover-up/fakery may arise in connection to this character. Why not? The topic of Obama is one of my favourite horses to jump upon. I probably said before but I'll repeat: the news of Baruch "Hussein" Obama supposedly being a "Muslim" was what blew me away first about this character back that time. Of course, the opposite was newsworthy as well, that he is a "Christian". Both can not be true at the same time, so which is the real one? 1. 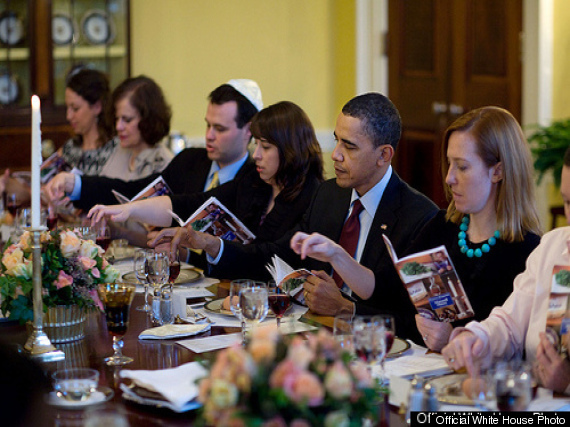 Obama being the first US President to hold the Seder in the White House. Not your typical Christian, let alone Muslim way of religious behaviour, now, innit? If it walks like a duck, quacks like a duck, then it is a ... duck! So, either he is a... duck, or maybe he is the first SIM president of the USA, impersonated by an actor in public, and all these (seemingly contradicting) infos about his religious/racial background is just wool over our eyes? A trick, so everybody would think "our guy is the President"? So that the Jews are happy that he is openly Jewish without the stupid Goyim having a clue, the Muslims are happy because he is a "secret Muslim", the Christians are happy because the Media says he really is a Christian, the blacks are happy because they have a "black President", the whites are...well, unless they are Christian there is not much happiness for them, but their happines is kept out of the package long ago...And in reality, the White House ceased to be the centre of power long ago, the power of the Presidents of old is distributed among a few un-known cadre, and these anonym world leaders just put out CGI characters on party lists to vote on by the masses every 4 years? President Barack Obama delivers a speech from Bagram Air Field, Afghanistan, Tuesday, May 2, 2012. President Barack Obama arrives to address troops at Bagram Air Field, Afghanistan, Wednesday, May 2, 2012. But when was it? And who was this clown shown above? The curiously never aging face of the Hamid Karzai clone, alway's contemptlative and signing something, in contrast to the rapidly aging Amanob clone. Looks like it was shot in a Hollywood parking lot too. ^ Guy on left appears to be a complete cut & paste. "Obama" appears to be a head transplant. "Airforce One"
appears to be an altered, normal aircraft with emblem and wide stairway added. ^ Same cut & paste guy on left plus 2 head/hand transplants. ^ Simple cut & paste of Obama atop another photo. It has to be fake, so much scum in one place would spontaneously combust! And here's a "different angle" - featuring a white staircase. Ok - so that staircase was a mobile staircase...Yah! Now, does this brown, chocolate-shade look like a shadow? Or does it look more like a poor shadow-rendering? I really hope this is just a pixel phenomena - and that those two US soldiers were NOT beheaded ! Are you referring to the shadow from his left arm? Admittedly, the "left hand" portion of the shadow doesn't seem to correlate. Obama salutes ... uh ... nobody. "I went where and did what? ... Kabul? Yeah, right."